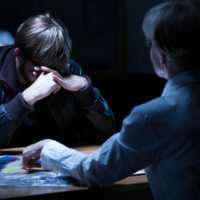 In crime or detective type TV dramas, the prosecution always seeks a confession of guilt, and usually gets one from the alleged criminal by the end of each 45 minute episode. A confession is seen as a neat and tidy way of having concrete evidence that the defendant was truly guilty of the crime. In these dramatical fantasies, the defendant holds out during the trial until the last crucial piece of proof is found and used against them. However, many defendants who plead guilty or confess to a crime never actually committed the act. Why confess to a crime that you did not commit? For one, the vast majority of both federal and state criminal cases never make it to court. Most defendants take a plea deal, which involves a confession of guilt in order to be let off with a lesser punishment. This saves the criminal justice system money, time, and resources. In fact, 94 percent of state criminal cases and 97 percent of federal cases end in plea bargain and a confession of guilt, according to the New York Times. Aside from admissions of guilt in order to avoid risking harsher punishment if found guilty at trial, there are a number of other scenarios in which an innocent person may make a false confession. The threat of a harsher sentence. In some specific cases, confessions are wildly inaccurate and unreliable. Children, for example, often give false confessions of guilt because they are easily prone to manipulation. Similarly, adults with mental disabilities may make a false confession because they simply want to be agreeable or appease an authoritative figure. People with mental disabilities or who are intoxicated may say something without actually meaning it to be truthful, or fully understanding the ramifications of what they are saying. Virginia police are not allowed to use physical or psychological coercion in order to force a confession from a suspect. Coercion includes use of force, drugging, threats against the defendant or their family/friends, inhumane treatment of any kind, trickery, lies, torture, or any other types of illegal manipulation. When coercion is found to have been used by the police or any other party, the admission of guilt is inadmissible in trial. If you made a false confession, or need the legal assistance of a criminal defense attorney for any other reason, call the Loudoun County, Leesburg, Winchester, Fairfax, and Prince William attorneys of Simms Showers, LLP today at 703-997-7821.